Park News - (1/12/18) Colossus To Reopen in 2019 and Peppa Pig for 2018... for details see below! “Take a boat trip with Peppa and her friends, ride on Schorsch ` s Dino and come on an exciting trip with Opa Pig` s train! The highlight: Visits Peppa ` s house and meet 'Peppa and Schorsch at the Meet & Greet!” The Heide Park Adventure Hotel will also feature new Peppa Pig themed rooms as well. 2019 - Colossos: Battle of Giants - (4/6/19) A great new video with POV footage mixed in showing off the new updated Colossos: Battle of Giants coaster trains racing across the course can be seen below. While the coaster is not yet ready for guests, they anticipate it will open to guests sometime this Spring once it gets TÜV approval and they complete all employee training. An early congratulations to Heide Park as well, because if the videos are any indication, this thing is FLYING through the course and looks incredible. They are careful not to show off any new looks at that wicked evil fire-beast they’ve created towards the end of the ride layout however, but what a rush that is going to be. (2/27/19) I’m a bit confused by this, but damn if these new pictures of Colossos at Heide Park don’t look incredible and frightening at the same time, as we witness the awakening of a new dark power. I can’t wait for the official final reveal of what is going on here, because Colossos looks awesome! (2/5/19) An interesting teaser video for the returning Colossos at Heide Park has arrived online, teasing that the “ultimate fight of the giants” is coming. (1/16/19) Heide Park has announced a new updated name for Colossos when it reopens in 2019 as “Colossos Kampf Der Giganten”. The new logo shown looks very similar to the one Merlin put out to promote Wicker Man coaster at Alton Towers, and if you follow this link and scrool down a bit, you’ll see that they have built a giant creepy tree-monster looking creature structure that the coaster will travel through at one point. Given that Wicker Man uses a lot of smoke and fire effects, it makes me wonder if Colossos will also do the same. (10/8/18) New rails can now be seen on Colossos at Heide Park if you check the latest photos posted to CoasterFriends.de. (Just scroll down). (9/29/18) Any readers been by Heide Park recently? I’m just curious if anyone has spotted any rehab work taking place to Colossos? Since the coaster is supposed to be up and running again for the 2019 season, there has been some curiosity about just what kind of work is being done to Colossos, how extensive it is, along with who is actually doing it. So far I’ve found a report posted to InParkMagazine back in June where crews from RCS and “Fa. Cordes” had begin the process of removal all of the Intamin made wooden track and ledgers from the ride. Then the park itself posted a video on August 10th showing off how all new wooden ledgers were being created by Cordes crew, and before that in July showing off the on-site crews taking the big track sections out one at a time. (see below). Now I’m just curious if they have started the process of putting it back together again yet. (1/12/18) Heide Park has announced that they have come to a decision regarding the fate of Colossos, the giant Intamin wooden coaster (with pre-fab track) at the park, which has sat closed since July 2016. Colossos will be renovated and reopen in 2019 after spending about 12 million Euros on the renovation, giving the park back a much missed iconic attraction. The process will be a lengthy one as they have determined that all of the ride’s existing track must be replaced with new pieces, which will thus keep the coaster’s status intact as a true wooden coaster experience. They do admit that they were considering a plan (I assume from RMC) that would have replaced the track system with a new “hybrid” model track with steel rails, but opted to stick with the wood. Look for Colossos to be up and running for the start of the park’s 2019 season. (3/17/17) In a somewhat shocking development Heide Park has announced that their massive Colossos wooden coaster (Intamin) will not be opening at all for the entire 2017 season. As seen on the Heide Park Resort Facebook page, a large decorated construction fence has already been put up, blocking all access to the ride area. So what happened to Colossos? From what Screamscape has heard, Germany's TÜV ordered the coaster shut down late last summer, as the ride experience had just deteriorated to the point where it was clear something was wrong. According to one report, Colossos had simply become too rough.. and not in the same way that you would expect a wooden coaster to get rough with age, but had evolved into an experience similar to having a jackhammer on your spine for the duration of the ride. 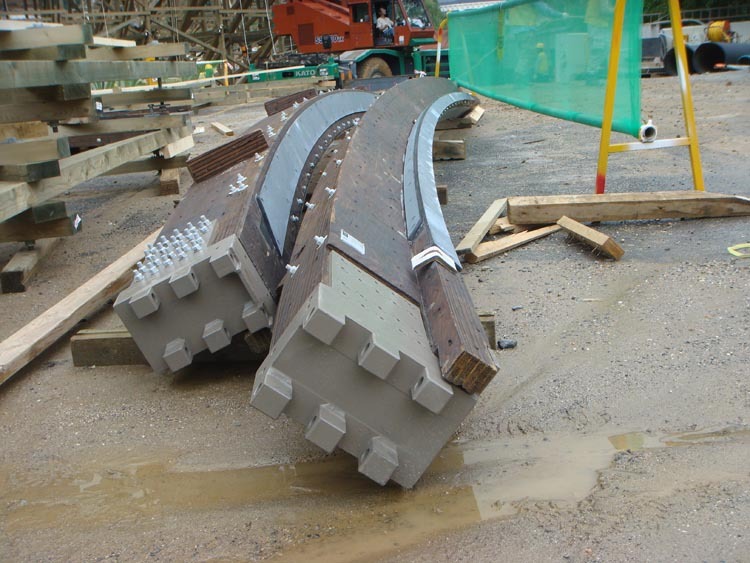 The idea was that down the line, when a section of the ride was in need of re-tracking, they could simply order the specific pieces needed and then swap them out, much like you would do with a steel coaster. As Colossos is the oldest of the four Intamin Pre-Fab wooden coasters, built to open in 2001, apparently we now know just how long this new design of track will last, as we've heard that Colossos is now in need of extensive re-tracking. So what's the problem? It seems this is going to be one hell of an expensive job, and by the time the ride was closed last season the park had already committed their 2017 budget towards building the new Ghostbusters dark ride, and did not have the funds needed to also re-track Colossos for 2017, so it is expected that the park's 2018 attraction budget will be spent to fix Colossos at this time. On a related note, I've also been told that T-Express at Everland in South Korea, the youngest of the four Intamin Pre-Fab coasters (opened in 2008) is now also listed as being closed on the park's website. While T-Express is probably just closed for regular maintenance, it does make me interesting in knowing how well it and the other two Intamin coasters (El Toro at Six Flags Great Adventure and Balder at Liseberg) are holding up as they age, and if any of them have had to under-go any track replacement over the years. (8/18/16) Screamscape sources tell us that Colossos at Heide Park is closed for the rest of the season. According to our source, some major issues were discovered with the track that need to be addressed, which could involve replacing some sections of track entirely.